A pdf version with illustrations can be found here : A look at Quebec agriculture and its future. The period 2007-2012 saw tremendous changes. The financial crisis of 2008-2009 has led to an exceptional environment of low interest rate, which, in Canada, has been coupled with a relatively open access to credit thanks to the strength of Canadian banks. Meanwhile, the evolution of the fundamentals of agricultural commodities markets has translated into a regime of historically high prices. This has created a very peculiar situation which may determine the possible trajectories of Quebec agriculture into the future. iii) the decrease in interest rate. The 1994-2002 period saw the remarkable development of hog production in Quebec thanks to a concerted effort of all stakeholders. Besides, it is during that same period that the quota markets of supply-managed production experienced a fundamental change when quota became an asset that could be pledged for financing purpose. Initially amortized over 5 years, quota quickly got to 7, 10 and finally 12 years amortization. This, coupled with decreasing interest rate, led to an easy access to credit, driving quota price up as most of the purchases were marginal in nature. Analysing the EBITDA margin ratio (EBITDA / Farm cash receipts), we note a decrease over time. This has only be reversed slightly over the last 5 years with farm product prices reaching historically high levels. Farm input prices have outpaced the increase in farm product prices most of the time. Then, efficiency gains have not been enough, or just helped, to cover the increase in input costs. Meanwhile, the ratio Debt / Farm cash receipts has steadily increased along with the ratio Debt / EBITDA. Yet, thanks to the jump in agricultural products prices after 2007, the upward trend for both ratios has stalled but the underlying level of debt is still high. To clearly see the extent of the impact of these high prices, we have estimated the growth of the physical output in Quebec agriculture. We note several noteworthy trends. First, the most remarkable one is the divergence of the pace of growth of the balance sheet (debt and assets) from farm sales, starting in 1997. In the meantime, overall output growth has been held back since 2007 mainly because aggregate output from livestock productions has not seen any growth. To put things into perspective, we could calculate the impact of a simultaneous increase of interest rate and decrease in farm cash receipts assuming 2012 farm output and 2012 farm debt. If farm product prices were to be on par with the average of the 2010-2012 period, then farm sales (excluding direct payments and based on 2012 output) would decrease by 5.5%. Based on a similar price context, we will assume that direct payments represent close to 10% of the farm sales. So overall, farm cash receipts would be 6% lower and consequently EBITDA would be down by almost 20%. Now, if the average interest rate was raised by 100 bp (1%), interest expenses would be up by 25%. 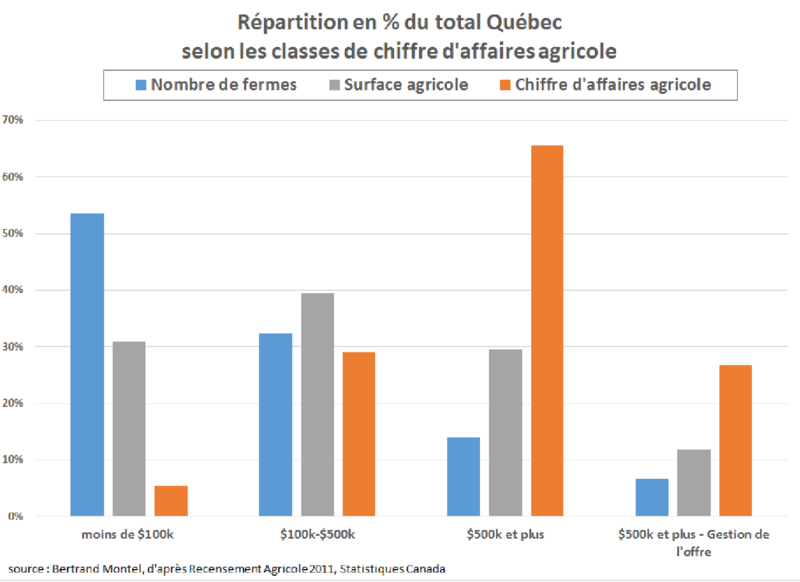 Combination of both shocks would result in the net cash income generated by Quebec agriculture decreasing by 29%. What could we say of today’s Quebec agriculture ? Its aggregate output is not growing. Its efficiency has been declining for a long period of time. Yet, its balance sheet has grown tremendously. Hence, it may be overly exposed to any increase in interest rate and/or reduction in farm product prices. All this is raising a few questions about the future of Quebec agriculture. How long may this unique combination of high farm prices and low interest rate last ? We have shown that simultaneous shocks for both variables would have a marked impact on Quebec agriculture. So, answering that question is key in assessing the risk of a severe downturn for Quebec agriculture in the foreseeable future. This is even more relevant when only considering the additional capital that will be required to ensure the transfer of assets from exiting farms, either to the next generation or to existing farms. How can Quebec agriculture increase its output ? Demographics and consumption patterns may impose some drag on dairy and poultry production. There would be some opportunities for the beef industry if only it could structure an actual value-chain. Crops have seen some dynamism and there is some room left for growth. As to Quebec hog production, output growth will be determined by the ability of meat processors to grow market share domestically and abroad which in turn questions the competitiveness of hog producers. How can Quebec agriculture increase its efficiency ? Answering that question will obviously be different from one production to the other. However, it will most certainly require investments to reach the right combination of economies of scale, of innovation in production [productivity], marketing [adding value] and management. 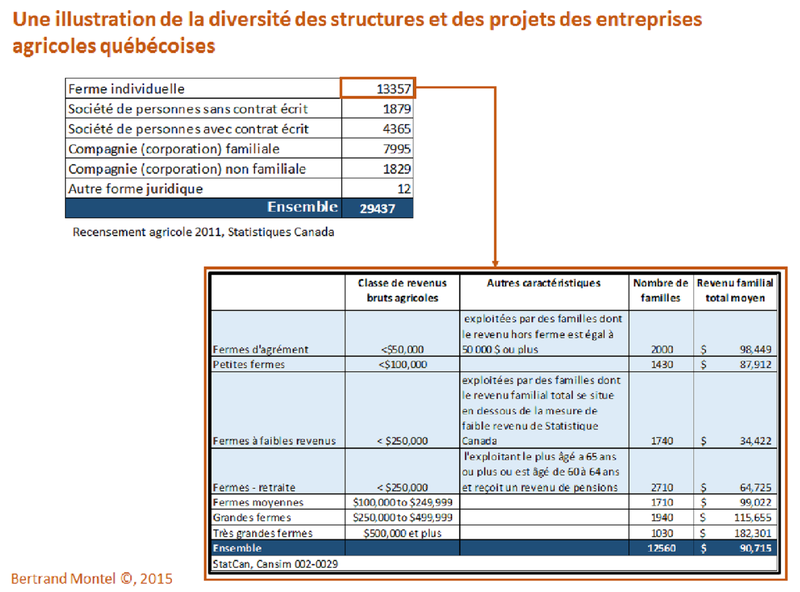 However, there may be some uncertainty as to the remaining financial capacity to invest within Quebec agriculture ? Are there enough farms able to carry on these investments ? If so, what could be done to strengthen them ? If not, what would be the consequences of a smaller agriculture in Quebec ? This has already been said by many : Quebec agriculture needs a vision, a strategy, and a proper public policy to support it.